If you want to rent a car parking space, or you have one space too many, the document you're looking for is known as a Car Parking Space Licence Agreement. 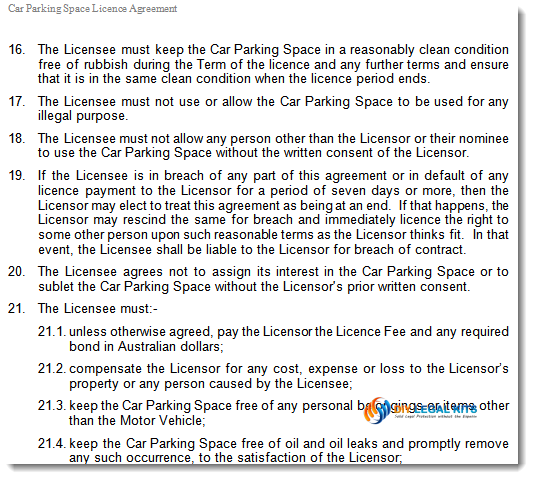 You can use our car park license agreement whether you are the owner of the carpark space or have the right to use the car space under another leasing arangement. The agreement sets out the rights and responsibilities of the Licensor (that's person who grants the right use the space) and those of the licensee (the entity who will rent the space from you). Putting the agreement in writing ensures that each party understands their obligations to the other. Putting a written contract in place saves you from being in the uncomfortable position of arguing over who said what, which can often happen when you rely on verbal agreements. Need more information? See this article which explains the difference between a licence and a lease. Available for immediate download and can be used as often as you like. Our fully secured ecommerce system allows you to purchase and download your Agreement safely. In just a few minutes you can have everything you need to protect your interests.